DON'T RISK YOUR JAMAICA VACATION! Get The Jamaica Travel Guide Before You Go! YOU'RE PLANNING TO COME (BACK) TO JAMAICA, BUT HAVE SOME CRITICAL QUESTIONS RIGHT? How to ensure your safety in Jamaica? How to enjoy your Jamaican vacation and save $$ at the same time? What are the best places to vacation? Where to find excellent 100% free activities? Where to find the most trusted tour guides? The most unusual (& fun) activities? New!! The best parks and gardens? The very best attractions for your kids? The best and safest nightlife spots? BE HONEST with me now, do you really feel that you know all that you need to? Well, The Jamaica Insider Guide is finally here, with all that and a lot more must have information - compiled by yours truly! First hand, practical, highly organized, easy to read, 'inside' tips & tricks that you can download, print and take with you right now - first time or 25th time! Many have spent hours and hours of research on travel sites trying to find all they need to know about Jamaica but you don't have to. I've already done that for you; everything you need to know is included here! This is revolutionary! As far as I can tell it's the first Jamaica Travel Guide to be written by a native Jamaican (that's me)! But it wasn't just me - MANY of my lifelong, generational friends and family contributed in one way or another. 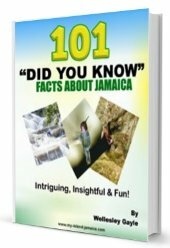 I took the absolute best of this site, which included hundreds of questions about Jamaica (seriously, last count over 300) , coupled those with our local, insider, knowledge to present you this precious guide. But that said, I've consciously tried my best to condense hundreds of pages of information into a neat, nicely packaged, simple & easy to read guide. This printable guide includes insightful information, recommendations, cautions, tips & tricks and everything you ensure you have a safe and fun-filled Jamaican vacation. Recommendations on how you should travel around Jamaica - safely and cheaply - Chapter 9, Part A. Where you should vacation in Jamaica -Chapter 10. How you can save money while vacationing in Jamaica -Chapter 4. Where you can find free, fun-filled events & activities in Jamaica Chapter 9. The best places to stay, eat and have fun in Jamaica for you-Chapter 5. The best places for nightlife in Jamaica (for you) -Chapter 5. Jamaica's Parks and Gardens you can enjoy -Chapter 12. The Best Educational Attractions & Sites -Chapter 11. These are just perfect for those looking for somewhere to bring their kids or students for a fun educational trip or adventure! 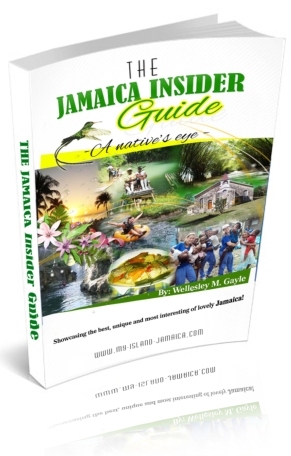 Jamaica Insider Guide illustrates a very informative overview of the island of Jamaica; the most complete impression of culture, people and places that I have ever come across. It was a lot of work on my part; lots of loss sleep, headaches, and precious family time, but I feel very very accomplished getting this to you. I've also added the following bonuses for you! Bonus #1 – A Pre-Travel Checklist – A must have! Bonus #5 – A handy Printable Jamaica Map - You'll need it too! 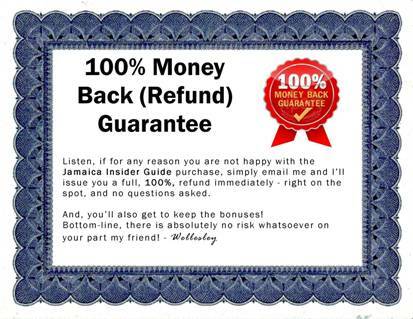 Bonus #6 - MY 100% REFUND GUARANTEE! I have learnt so much and as I read, my mind is racing as to how many places I shall visit now each month with my girls! 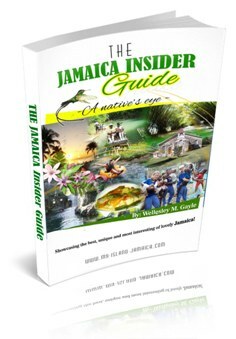 Why a Downloadable Jamaica Travel Guide (Jamaica Insider Guide) or E-Book? Get it RIGHT NOW - on your computer! Save time and money while you are planning, and all through your vacation. Plus, no shipping costs. Always up to date. If I find something worthy,it will be in the book soon after . The information in a hard copy travel guide books is usually at least one year old, often older. In Jamaica - that's a lifetime! Get free updates for a year. Guide Book updates are tracked here. Just email anytime within a year of purchase and I'll send you an updated Jamaica Travel Guide. So even if your trip is 6 months away, you can start planning now, and get an updated guide right before your trip. Make as many copies as you want. If your group splits for a time during vacation, everyone can have a copy! No need to carry a heavy book while on vacation. You print it on your own 8.5" x 11" paper and when you're here, just take the pages you need at that time. You can write on them, fold them, stick them in your back pocket. FREE Copy? Here's How To Get "3-Free" Chapters right now! Thank you for visiting. I hope you love it as much as I do! P.P.S. Interested in earning from the Jamaica Insider Guide? Click Here to become a reseller.